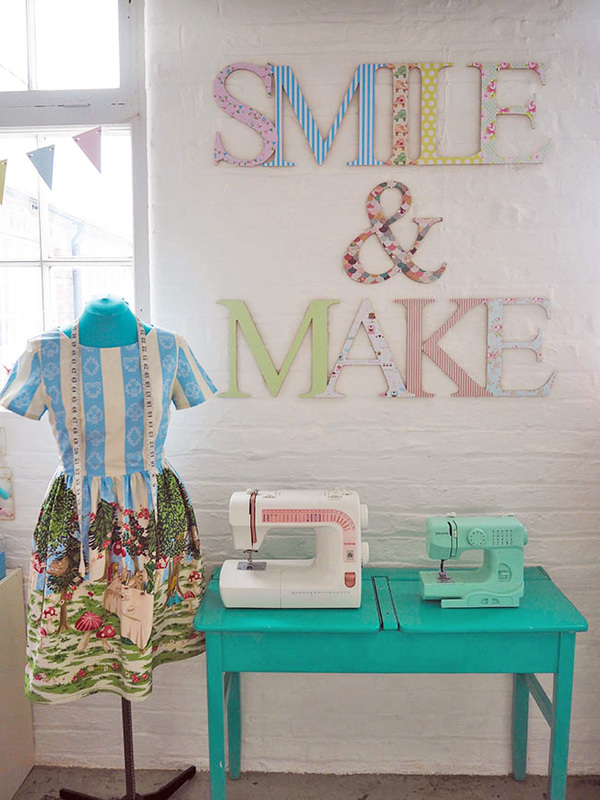 Tilly and the Buttons: Sewing Space Tours...Lucy's Factory Studio! Hello, I’m Lucy! 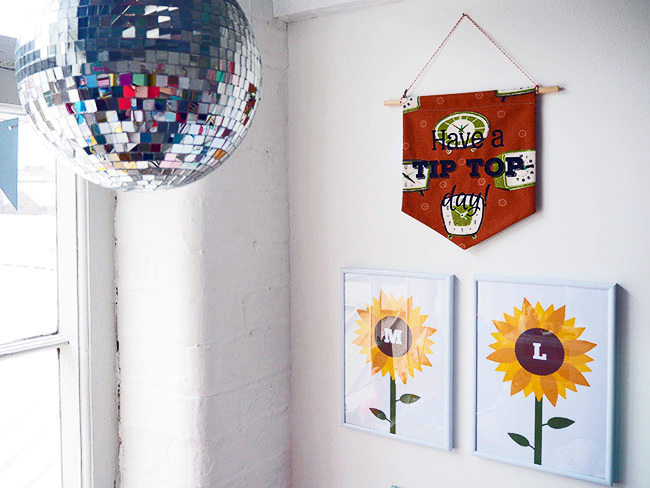 I live in Staffordshire and get crafty at my studio in a converted pottery in Stoke-on-Trent, and I blog at Smile and Make. I’m an all-round crafter and I enjoy sewing and making anything I can try my hand at, but my current obsession is dressmaking. Sewing is a real therapy for me - I lost my wonderful husband Michael to a brain tumour in February this year, and sewing has helped to provide a focus and an escape at a time when my world has been turned upside down. 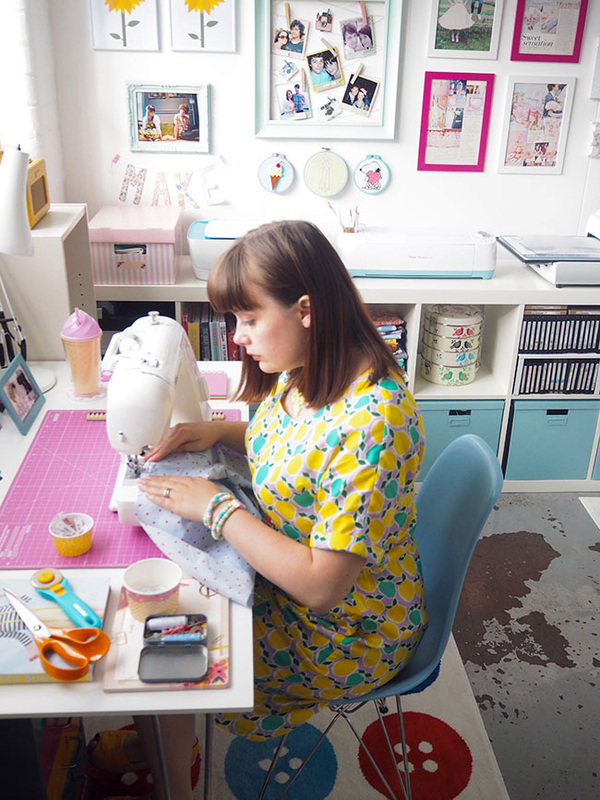 I first started sewing back in 2008 when I moved to London after university to train as a solicitor. During my student days at law school, I bought cheap vintage dresses from a market stall in Deptford, which I customised and altered. Despite this, my early forays into making my own clothes from scratch were not very successful, so for years I stuck to alterations. 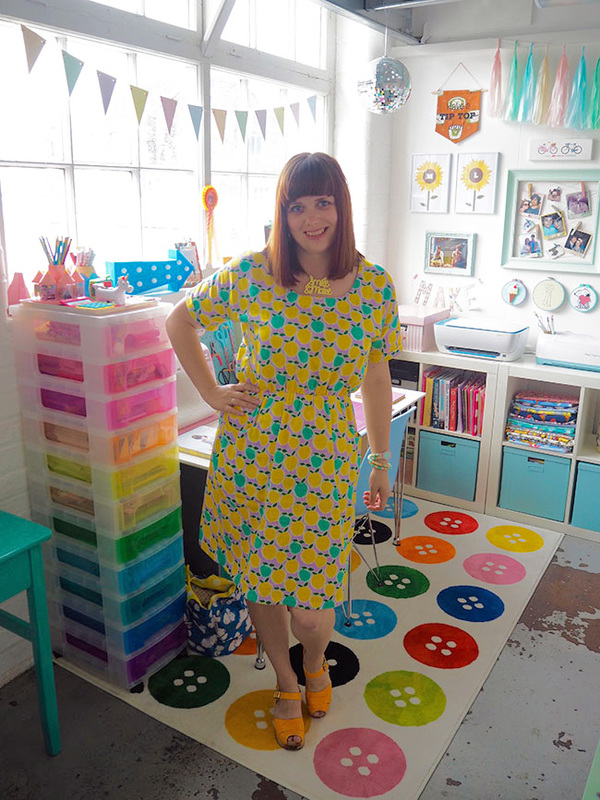 Knowing my passion for sewing and for pretty dresses, last year Michael encouraged me to give dressmaking another go – one bright yellow Bettine dress later, and I was hooked! I’m now steadily building a wardrobe of handmade pieces. I love vintage silhouettes, cute novelty prints and bright colours, so my handmade wardrobe is a rainbow of colour and kitsch! Michael was very creative and we were always making things together, like quirky pieces for our home and details for our wedding. Continuing in this tradition I now make fun products inspired by his designs and quirky sayings such as “Tip Top Like Soda Pop”, which I sell in my Etsy shop Smile & Make to raise money for brain tumour research through a fund I established in Michael’s name with The Brain Tumour Charity. My studio is in the old china hall at the converted Spode factory in Stoke-on-Trent, a renovation project carried out by the arts charity ACAVA to foster the growing creative community in the area. The other residents of the studios are all artists from a range of disciplines which, combined with the history of the site, makes it an inspiring place to get creative. 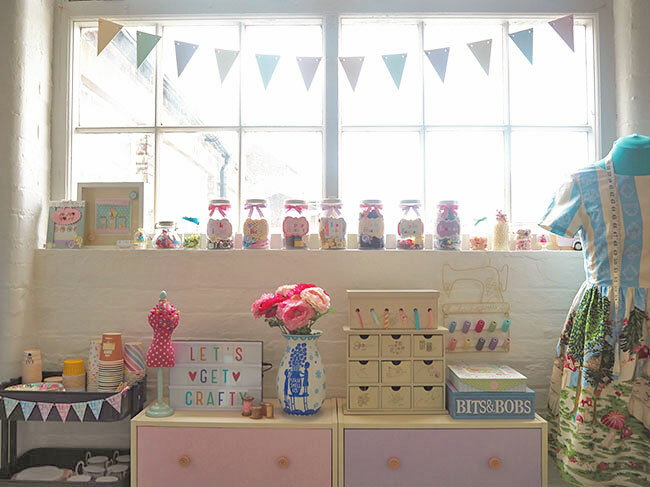 I share the space with my Mum, Spotty Daisy, who makes pretty handmade decorations for weddings and celebrations. We took the plunge and signed up for our own studio a couple of months ago, as I wanted to try doing something creative as a change in direction. It’s great to be able to work together as we both share a passion for making, and we spend lots of lovely afternoons at the studio creating and sewing while we chat and drink tea. Fortunately we both have very similar taste, so we have surrounded ourselves with candy pastel colours and whimsical design with a vintage twist. 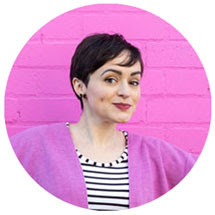 I’m the opposite of minimalist and love to fill every available space with inspiring objects, such as a bright pink flamingo, an ice cream novelty lamp and Lego caravan on my window ledge, and pictures from my wedding and things I have made on the wall. 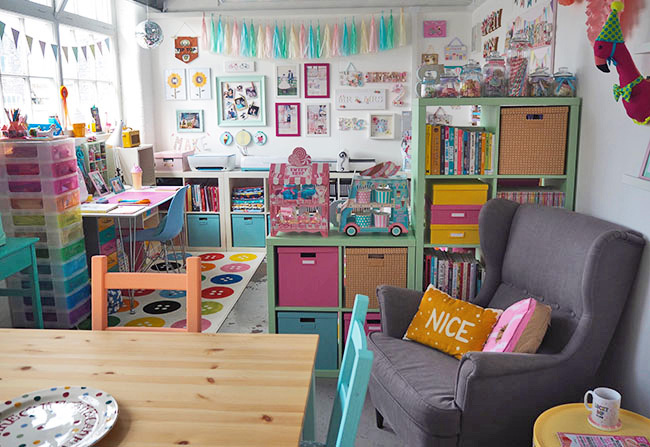 Everything in the space is multi coloured and usually covered in pattern, too! 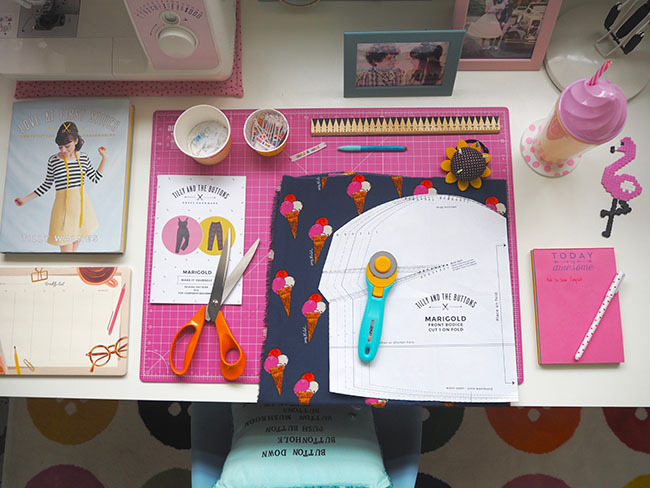 At one end of the studio we each have our own workspace, and at the other we have a big table which doubles as a space to cut out fabric, and somewhere to host crafternoons. Our space retains much of the character of the original factory, such as the two large paned windows and the original concrete floors with painted walkways – although the concrete floor can get a little chilly so we each have a giant button Ikea rug under our desks, a craft room staple! My desk sits underneath one of the windows and is flooded with light. The best time of the day is when the evening sun bounces off the disco ball I have hanging over my desk, and fills the room with polka dots of sunlight. We furnished the studio with a mix of modern bright furniture (lots of Ikea to give us ample storage for our extensive craft supplies!) and some upcycled pieces. One of my favourites is an old school desk that Michael and I found in a charity shop in Battersea. We stripped it back and painted it a vibrant turquoise, with pink chalkboard inside the flap of the desks. 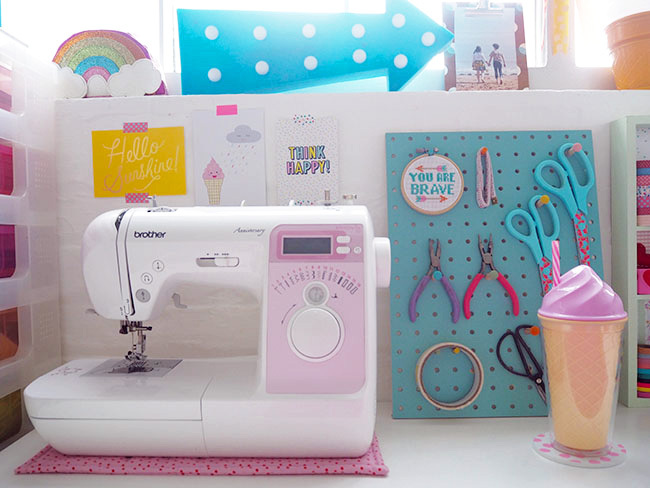 I recently upgraded my sewing machine, so the school desk houses my old one, as well as a cute mint green machine I got as part of a Mollie Makes subscription deal. 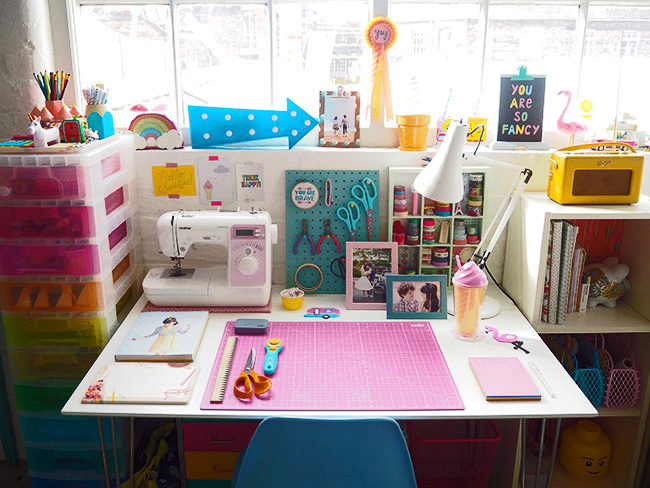 Having more than one machine is great for when friends want to come over and get crafty, and we also plan to host creative workshops at our studio in the future. Another favourite piece is my record cabinet, which is home to Michael’s collection of records. I painted the doors yellow and turquoise and added handles from Anthropologie, which read “deux” and “cinq” to represent the 25th, which was both the date we met and the date we got married. 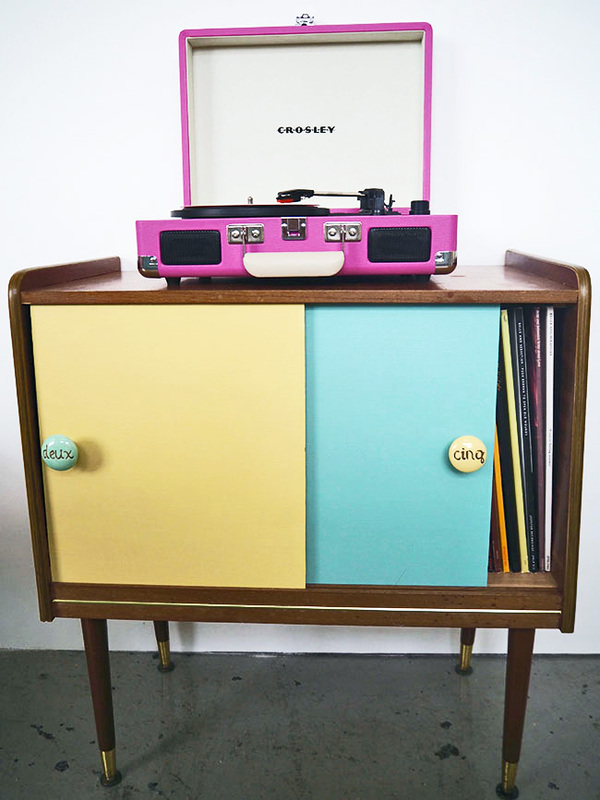 My bright pink Crosley record player sits on top, and I usually listen to something like Belle & Sebastian while I sew. I keep my fabric and patterns in the Ikea storage cubes close to my desk. 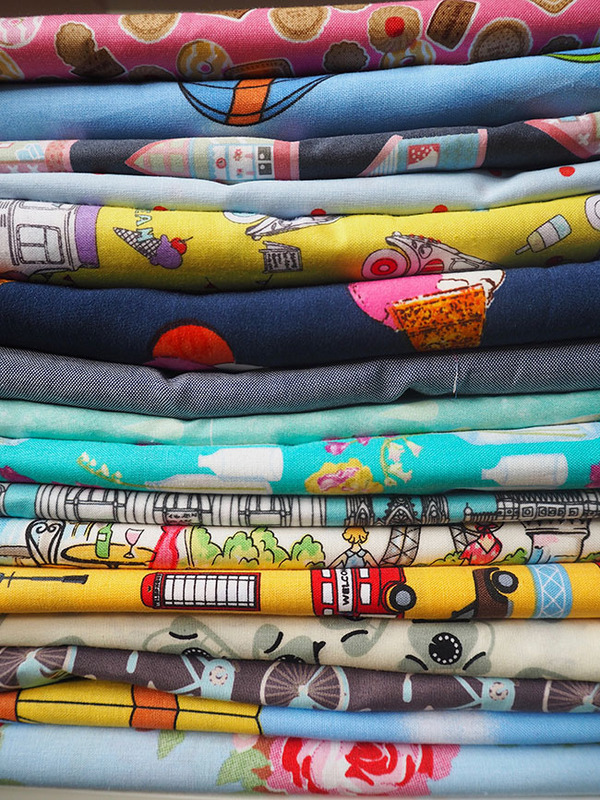 I like to have all of my fabric folded in a stack so I can easily see all of the colours and prints to choose my next project. I store all of my patterns in plastic A4 wallets so I don’t have to keep folding them back into their envelopes each time, and I keep my scissors to hand on a peg board on my desk. 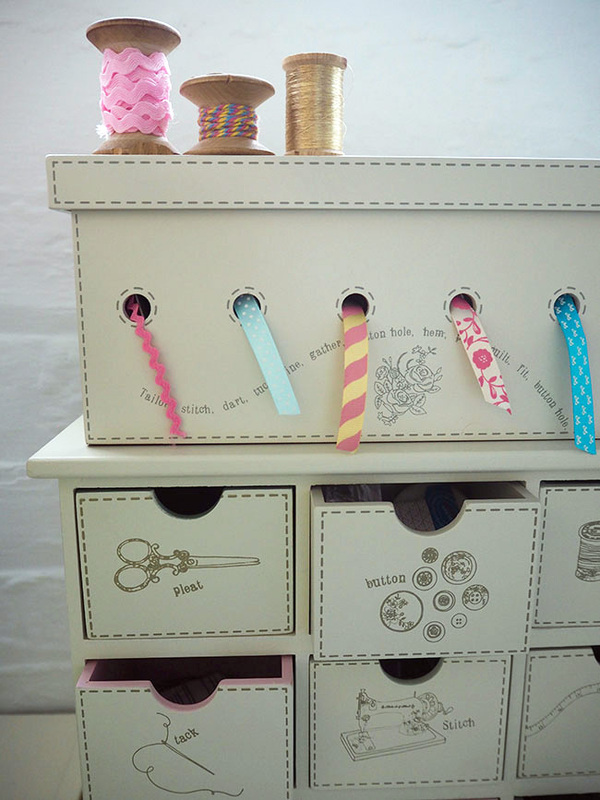 The rest of my sewing notions are stored in a little set of drawers from Laura Ashley, and my ribbons, buttons and adornments are lined up in the sweet jars we used for the sweet stall at our wedding. 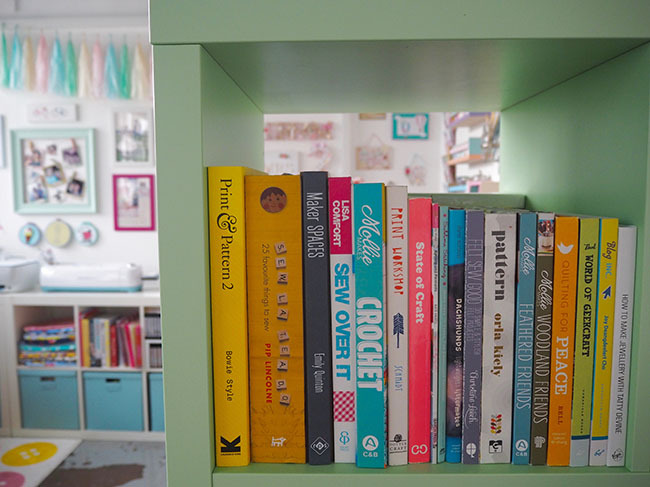 I also have an extensive library of craft books and magazines to hand for when I’m in need of inspiration. 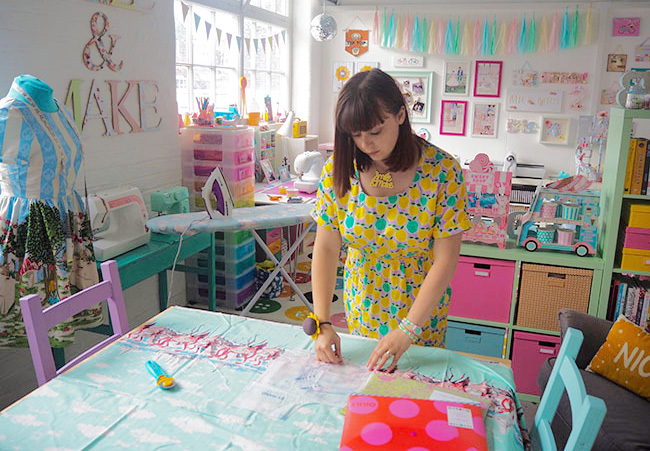 I’m currently working on some fun new handmade outfits to take on my upcoming holiday, including a flamingo border print dress and a cute ice cream pattern Marigold jumpsuit. I find I’m most efficient if I cut out lots of projects at a time so I have everything ready to just dive in and sew. Once I’ve cut out each pattern from my chosen fabric, I store all of the pieces in a clear cellophane bag to keep things neat but still allow me to see the beautiful prints while they are waiting to be sewn up! 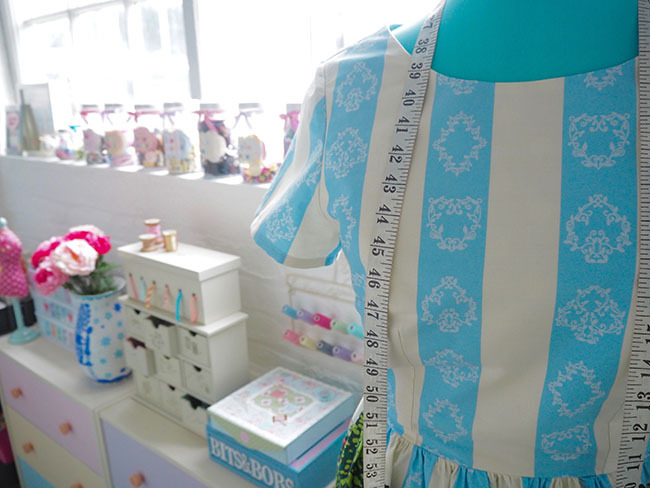 I hope you’ve enjoyed taking a look around my studio! Thanks for sharing your space, Lucy. We love it, and we love your bright Bettine dress! Psst! 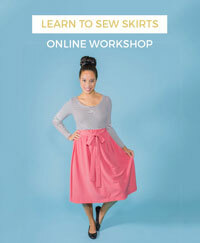 Have you already checked out our other Sewing Space Tours? Fancy submitting yours? Find out how to here. Can't wait to see your space!